If the mainland of India is a storehouse of myriad tourist spots, its islands are not far behind as these tiny pieces of land offer the much sought-after serenity and privacy for leisure travelers. 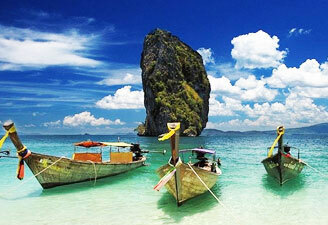 Located in the Bay of Bengal, Andaman & Nicobar Island is a premier tourist attraction in the country. Powder white beaches, swaying palm trees in the mild breeze, lush, green rain forests, sound of waves breaking on a coral reef and chirping rare birds all - of these are the major highlights of Andaman and Nicobar Islands. This Union Territory of India homes some of the oldest tribes in the world. The visitors have a choice either to indulge in adventure activities as trekking, diving and snorkelling, or to lie down by the sea and enjoy the cool breeze gently caressing your body. This group of 572 islands lies 193 km away from Cape Negrais in Myanmar, 1255 km from Calcutta, and 1190 km from Chennai. Situated in the Bay of Bengal, these two important groups of islets are known as Ritchie's archipelago and Labyrinth islands. Located to the south of the Andamans, Nicobar islands are 121 km from Little Andaman island. Only 36 islands out of 572 islands are inhabited. These islands are placed between the latitudes 6º to 14º North and longitudes 92º to 94º East. All the 572 islands of Andaman and Nicobar Islands are formed by a submarine mountain range, which separates the Bay of Bengal from Andaman Sea. Maximum altitude of these islands reaches up to 730 m at Saddle Peak, which is mainly formed of limestone, sandstone and clay. 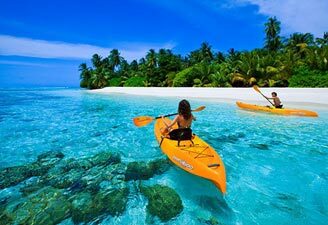 Andaman and Nicobar Islands experience a tropical climate. It rains here medium to heavy during the monsoon, and the period from May to mid-September and November to mid-December. You would never experience extreme climate here except rains and tropical storms in late summer that often results in heavy damage. More than 3,000 species of plants including mangroves, epiphytes (130 ferns, 100 orchids), palms, woody climbers, timbers (teak, mahogany and Andaman paduk) are harbored in the canopied rain forests of the islands. A large variety of tropical fruits are also found here. Marine fauna is diverse including a wide variety of tropical fish and coral. Considering the diversity and uniqueness of fauna and flora and the fragile nature of the eco-system here, 96 sanctuaries spread over 466.218 sq km and nine National Parks spread over 1153.938 sq km have been notified on these islands. A number of aqua-sport facilities including water-skiing, sail boats, windsurfing and speed boats etc. are offered in this unique complex. Other possible and safe water sports like paddle boats and row boats etc. are offered here. It's equipped with one sea water swimming pool and a change room. Another attraction here includes a Memorial for the Battle of Aberdeen fought between Britishers and Andamanee aboriginals in 1859. You also can visit nearly located amusement park which is equipped with roller coaster and pleasure rides or a children traffic park adjacent to it. The best way to enjoy under-water marine life and view the rarest varieties of corals is by snorkeling in Mahatma Gandhi Marine National Park, Carbyn's Cove Tourism Complex, Havelock and other islands on all days from dawn to dusk depending on the weather.